Imagine, if you dare, the agonies of the talented people trapped inside the collapsing tomb called “The Addams Family.” Being in this genuinely ghastly musical — which opened Thursday night at the Lunt-Fontanne Theater and stars a shamefully squandered Nathan Lane and Bebe Neuwirth — must feel like going to a Halloween party in a strait-jacket or a suit of armor. Sure, you make a flashy (if obvious) first impression. But then you’re stuck in the darn thing for the rest of the night, and it’s really, really uncomfortable. Why, you can barely move, and a strangled voice inside you keeps gasping, “He-e-e-lp! Get me out of here!”… A tepid goulash of vaudeville song-and-dance routines, Borscht Belt jokes, stingless sitcom zingers and homey romantic plotlines that were mossy in the age of “Father Knows Best,” “The Addams Family” is most distinctive for its wholesale inability to hold on to a consistent tone or an internal logic. Read the full review. If you’re a New Yorker with children, or if you’re bringing the family to Manhattan this summer, you’ll have to go to “The Addams Family.” It won’t kill you. You’ll laugh a lot, though never during the unmemorable songs, which are supposed to be funny but aren’t. You’re more than likely to spend a considerable part of the evening wondering how much the set cost. And as you depart the theater, you’ll probably catch yourself wondering whether it was really, truly worth it to take your kids to a goodish musical whose tickets are so expensive that you can buy an iPad for less than the price of four orchestra seats. Read the full review. “The Addams Family” — the 1960s sitcom, that is — was famously kooky, spooky and altogether ooky. The new Broadway musical, based not on the sitcom but on assorted one-panel cartoons drawn over the years by the New Yorker’s Charles Addams, is kooky but not spooky or ooky; nor is it neat, sweet or petite (as the song goes). What this “Addams Family” has is the gloweringly perfect Nathan Lane, who gamely thrusts Gomez’s rapier at anything — or any joke — that moves. But $16.5 million has brought forth an ill-formed one-dimensional cartoon with lines and shading not quite inked in. Read the full review. Bottom Line: Even the talents of Nathan Lane and Bebe Neuwirth can’t make this musical adaptation of the familiar property more than just ho-hum. Read the full review. 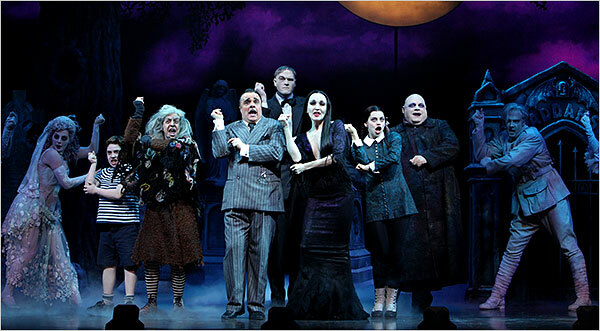 Everything about the beginning of “The Addams Family: A New Musical”…promises a familiar, funny, even exciting night at the theater. Why, I wondered, did this terrific show get such terrible word-of-mouth? As “The Addams Family” progressed, however, my reaction changed. I experienced what might be called the six stages of musical mortification: excitement, expectation, impatience, disbelief, distraction, disappointment. When, shortly after the beginning of Act II, Uncle Fester asks the audience directly “What happens now? Can this be repaired? Or do you all leave in an hour feeling vaguely depressed?” he was not just talking about the complications in the story up to that point. Unintentionally or as an inside joke, he was also referring to the musical itself. Read the full review. Do you think the show deserved to get so exhaustively panned? I saw the play, Frankly, I was dissappointed.. The British writer wrote Harry Potter and the Philosopher’s Stone in Edinburgh coffee shops, sometimes on napkins rather than paper, but is now worth close to a billion dollars, according to Forbes. I guess no one is eternally young.